The lack of any remorse shown by a fighter who had to withdraw from one of the biggest fights of the year due to his own negligence spoke volumes. After testing dirty not once but twice for the performance enhancing drug Clenbuterol, Alvarez still held firm to his tainted Mexican meat excuse. What we have here is a clear cut case of denial. Flanking Alvarez were a trio of sullen faced Golden Boy brass that looked about as uncomfortable as could be as they sat in “support” of Alvarez. Let’s go ahead and call them “The Enablers”. Am I suggesting Alvarez is guilty as charged? Given what has transpired over the past week, yes… that is exactly what I am suggesting. As I understand the impromptu press conference that was held yesterday was actually scheduled to take place exactly a week ago to the day. That’s right, an unnamed PR rep from Golden Boy placed calls over a week ago to A-list media members, (no I wasn’t on that list), telling them there would be a press conference held at the Golden Boy office on Monday but no details were given. Early that Monday the press conference was postponed and the next thing anyone knew the Nevada State Athletic Commission had changed the date of the Alvarez hearing from April 10th to April 18th. The wheels were coming off the bus quickly and even a “bottom tier” journalist like myself could see this show unraveling right before our very eyes. Monday’s announcement came as a surprise to exactly no one. The Dog and Pony show that took place yesterday was an exercise in futility. The intention was most likely to save face but at the end of the day the charade was pointless at best. Giving Alvarez the benefit of the doubt for a moment, if he and everyone and his team were aware of the rampant problem in Mexico and its athletes, didn’t one of them have the common sense to stay away from red meat while training South of the Border? I mean, you are scheduled to fight in a multi-bazillion dollar blockbuster. Didn’t the thought of all these other athletes problems with Mexican meat occur to ANY OF YOU? Or, is the story you are running with purely a crock of bull? (Pun intended). Enough time to promote the fight? Excuse me if I am mistaken but wasn’t there a press conference held on February 27th to announce the rematch? Seems to me any and everyone knew darn well about the rematch. It was the most talked about fight of the year. And when Alvarez said, “I want to apologize to HBO, Tecate and Hennessy and all my other sponsors, the media and to everyone who is involved in the promotion of this event, and especially to the fans,” it seems pretty clear to me that the promotion for this fight was more than on the right track. If you really thought Alvarez was clean wouldn’t you have went ahead with the fight no matter the date of the hearing? So, to suggest there wouldn’t be enough time to promote the fight is akin to saying you tested positive for a performance enhancing drug is because you ate a Carne Asada Burrito from a street vendor in Guadalajara. Let me put it like this; the next person I speak to that believes Alvarez is not a cheater will be the first. Here’s what I don’t understand. Why is Oscar and the rest of the Golden Boy Honcho’s willing to stand by Alvarez and expect us to believe this half baked excuse? 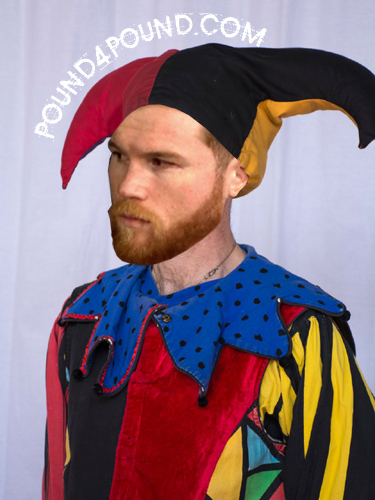 Yes, I know Alvarez is the only goose that is laying the proverbial Golden Egg for the promoter right now, but someone might want to stoop down and get a whiff of one of those eggs. It’s highly unlikely any statement like that would ever happen but if it does my consultation fees are $4500 per hour and a check can be sent to Pound4Pound.com at your earliest convenience. I’m not sure what else they are shooting in those steers down in Mexico but while it allegedly is enhancing your physique and endurance it ain’t doing a damn thing for your perception of reality! Hence the Aprils Fool blast. This entry was posted on Wednesday, April 4th, 2018 at 2:59 am	and is filed under Boxing. You can follow any responses to this entry through the RSS 2.0 feed. Both comments and pings are currently closed.